I already knew lots about core competencies before this activity because I already had to do them for certain classes. And I have a firm understanding of what they are and mean. So I really didn’t learn anything new. How can your knowledge of the Core Competencies help you in your school life? Personal life? The knowledge from Core Competencies can help me identify situations and can help me sort through things. I really don’t see it helping me too much in my personal life. Below is my groups scrpit for the “Substance Abuse Role Play” project. The following is my argument for what way we could handle the French and Native people that came to Britain. As a British official, I realize there are many alternatives to governing Quebec. I have chosen the policy of isolation to ensure the colony is properly run. Though there are many other choices, I believe mine will be the best decision for the people of Britain. It allows the French and the Native’s to continue their way of life well the British can keep our ways. Which will, in the end, result in less chaos. We also don’t have to worry about them following our rules, government, and religion. Which would also make them happier than deporting them because they are a part of our country now. People that are in a reserve would be protected by our government, as well as their own. Making the French and the Natives follow our laws could have an outcome of an uprise from them, which could bring our government down as well. As I have outlined above, I believe the best policy for governing Quebec is isolation. This will ensure that the colony will remain under British control and provide wealth for our glorious country. Will there ever be a way to accurately predict when a tsunami is coming in time to alert the people in danger? This picture is from the BBC News website. I love studying the way natural disasters occur and work. But when I came across tsunami’s I also looked at other disasters like landslides and volcanic eruptions. Tsunami’s seemed to be one of the natural disasters that don’t have any way of predicting it, all they know is if there is an earthquake, a tsunami should be on its way. It’s means something to me because maybe I could figure a way in the future to help fix the problem. How is this question meaningful to others? This question isn’t meaningful for just me, it’s means something for everyone. Just think if scientists could figure a great way to tell when a tsunami is about to arrive, that it could change the world. We could end up saving a lot of innocent lives! Do we even have the technology to build something to help us? Can a tsunami even be tracked with the world always changing? How would this affect our world? What do scientists do to make their prediction for when a tsunami is coming? What are things that could be stopped if we did figure something out? What are ways to warn people? The Indian Ocean is one of the few places with no type of a tsunami detection system what so ever. There is a device that each system combines a surface buoy with a bottom pressure recorder (BPR), which measures incremental changes on the seafloor. This device has been mainly used by the United States. Since the Indian Ocean has nothing like this it’s harder to tell if one is coming, which means the people who live near the Indian Ocean could be in danger. Even if they did have this type of technology at their fingertips they don’t have a good way of getting the word out, they have to do it by a call. How can this information help answer your main or sub-questions? This information helps me answer my sub-question “What do scientists do to make their prediction for when a tsunami is coming?” It talks about how scientists use a device called BPR (Bottom Pressure Recorder). It’s able to measure the changes on the seafloor. It’s also connected to a surface buoy. 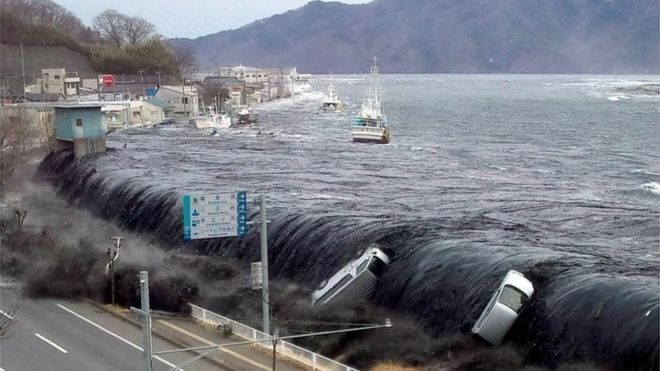 This shows the way scientists make a prediction for a tsunami approaching. When a tsunami is coming an advisory is posted as it approaches with strong currents or waves. They post the advisory to help warn people who live near the water before the tsunami hits. The threat of the tsunami can continue for hours. The appropriate way to handle a situation like this is to take it up with local officials who may, close beaches, help evacuated harbor and marinas, and telling ships to come back from deep waters if it’s safe to do so. This information helps me answer my sub-question “What are ways to warn people?” It talks about how an advisory can be posted talking about how we can talk to local officials who can shut down beaches, harbor, and marinas, and getting ships out of deep waters. This could be the answer to warning people. Damage from a tsunami is caused by an immense force of the tidal wave hitting the shoreline. The flooding can cause damage for several weeks. The damage of a tsunami can cause destruction, damage, death, and injury. The impact costs lots of money and actual effects of it continue many years after. This information can help me answer my question “What are things that could be stopped if we did figure something out?” It says that there are many bad things that can happen if a tsunami hit like destruction, damage, death, and injury. We could avoid this all if we came to some sort of a conclusion of a device that could help us. The next step I would take is to look how far we’ve come in the BPR. So then I could figure out why we’re not trying to make something better so we can save more lives. I want to help more but I’m only a high school student so I can’t do too much. So my next step after that would be to sketch different things that could work and help us. I would search up who is working on something that can help and maybe see some of their ideas. And try to add onto them. The questions I needed to research in order to research my topic were all my sub-questions which are: do we even have the technology to build something to help us, can a tsunami even be tracked with the world always changing, how would this affect our world, what do scientists do to make their prediction for when a tsunami is coming, what are things that could be stopped if we did figure something out, and what are ways to warn people? I used a new tool on the “Riverside” website called “Gale Science in Context.” It helps to break down our “I wonder” question. It really helped me come up with some questions to ask and some answers to answer them. One familiar digital tool I used was finding good websites on the web. I know quite a few websites that really aren’t that don’t give a real answer to questions or answers that other people can change into wrong ones like Wikipedia. The process I used to investigate my topic started with me thinking about things that interest me. Then the idea of natural disasters came to mind, an I thought why not do it about tsunamis, because they are so dangerous. Then I thought about ways I could make my question stronger. Once I got some help to make it better I could begin my research on it. Then the last step was to format it to the way we’re supposed to. I verified and cited the information I found by looking at their sources, and where they got it. I would also look at two other cites to make sure they didn’t make up their information. Completing this project wasn’t too hard. It was easy for me to find good information on my subject. I also was able to put my project together very easily. I could’ve chosen a bit of a wider “I wonder” question, to help get more information. This video is by PacificTWC. It talks about what a tsunami is, what it causes, how people warn others about the tsunami impacting, and how people handle a tsunami that could be coming. This video helps answer most of my sub-questions and my main question. This is my “Core Competency Reflection” for my science 9 banana surgery. This is my Personal Health and Wellness sheet. This is my core competencies for the project above. For the “Community Connection” assignment I choose to pick someone that creates amazing things as Tammy Pilon shows in her art. I chose her to interview because, she choose the path of art, which is a struggling path to follow but, the fact that she was able to come out on top with astonishing masterpieces, inspired me to pick her because the following art is something I want to do as well. I learned that pursuing art isn’t an easy job, as Tammy was telling me about how she got where she is now wasn’t the easiest thing to do. It also taught me that even though it’s hard to make a living out of art, it’s a job that she’s happy to do. Because if you “choose a job you love and you will never have to work a day in your life – Confucius.” This interview broadened my knowledge of how to become a successful artist, and opened opportunities I didn’t even I had! The first two pictures are tammy’s artwork. Why are you passionate about your job/hobby? Choosing Art as a career is for people who want to have a fulfilling and balanced life. Don’t expect to make a lot of money but expect that what you are doing is going to make you happy. I do recommend starting out in the commercial art field as I did because I was glad to be able to be hired by companies to work a 9-5 job and be able to pay my rent and pay my bills without having to worry. Trying to sell artwork is difficult because you never know when you will sell and get paid so you can’t rely on it. Even as an art teacher I have to also have another job to supplement my income. Explore all the things you enjoy doing. You don’t have to settle on just one. I was also interested in music and now I do that too as a hobby. That’s what makes your life balanced. What classes did you take to get where you are in art? How were they? I studied Graphic Design & Illustration at Capilano College. I graduated in 1989. Now the program is called The Ideas Program and it is Capilano University now. I recommend it over Emily Carr for young people who want to be able to get a job when they finish post-secondary school. When did you decide you wanted to go into art? Why?